Thomas College is located at 180 West River Road in Waterville, Maine. From Interstate 95 exit 127 (formerly 33), go east on Kennedy Memorial Drive (Route 137). In approximately 1.5 miles, turn right onto West River Road (Route 104 South). Thomas College is 1.5 miles on the left. By Bus:Greyhound offers regular passenger service to Waterville, stopping at J&S Gas Station. More information about Greyhound schedules and fares can be found at www.greyhound.com. By Train: The Amtrak Downeaster has service from Boston, MA (North Station) to Portland, Freeport, and Brunswick, ME. For information about Downeaster schedules and fares, go to www.amtrakdowneaster.com. *Note: All Amtrak trains arriving from south or west of Boston arrive at Boston’s South Station. The Amtrak train from Boston to points north departs from Boston’s North Station. By Plane: The two major airports in Maine are Bangor International (BGR) and Portland International (PWM). For information about Bangor International schedules and fares, go to www.flybangor.com and for information about Portland International schedules and fares, go to www.portlandjetport.org. 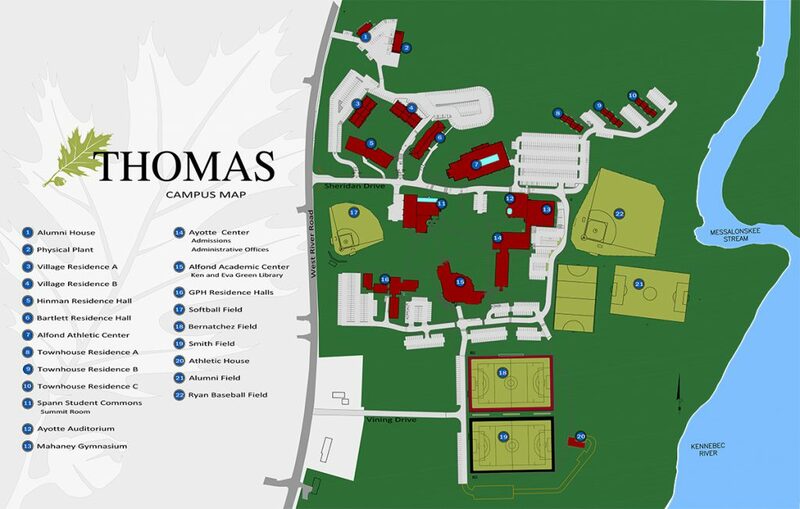 With advance notice, a member of the Thomas community can provide a pick up for your visit to Thomas College. Email admiss@thomas.edu or call 207-859-1101 with your arrival plans. It is also possible to rent a car from several locations in Waterville.